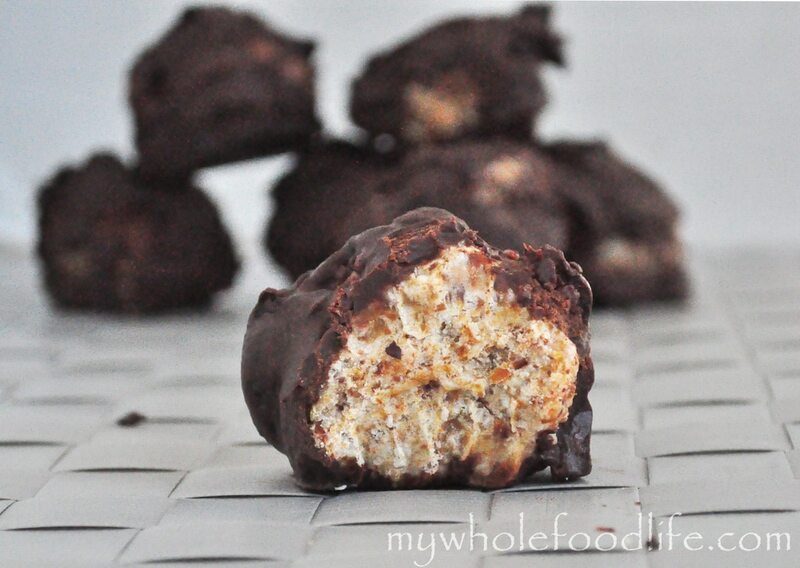 Coconut Truffles that are vegan and gluten free. Let’s be honest, these coconut vegan truffles are not an everyday treat, but when you want to indulge a bit, it makes the perfect little bite of sweetness with none of the bad stuff! These were a big hit in our family and I hope you like them too! They only take minutes to make too! I must admit, I rolled these a bit big, so they were more than a bite. I suggest rolling yours into a bite friendly size. These should keep in the fridge for quite some time. I used coconut butter in this so when you take a bite, the coconut literally melts in your mouth. If you haven’t tried coconut butter yet, you need too! That stuff is so good! I get Nutiva Organic Coconut Manna. If you like my Coconut Cream Larabars, you will love these! Chocolate and coconut make the perfect combination for these delicious truffles! In a food processor , combine the dates and shredded coconut. Then, add in the coconut butter and coconut oil. When the dough is formed, roll into bite sized balls and place in the fridge on a lined baking sheet . Parchment paper works great for this so the balls don’t stick. Once the balls are firm, heat your chocolate and milk using a double boiler. Take each ball and roll into the chocolate and place back on the parchment lined sheet. Put in the fridge for a few hours so the chocolate can set back up. I should add, when you go to eat one out of the fridge, it will seem hard to bite into at first. As soon as you chew it though, the coconut melts in your mouth. Enjoy! I'm looking forward to making these -- they look good. I was wondering if you could add how many ounces of dates and chocolate?? That would help for those of use who may substitute other kinds. I'm not familiar with the type of bar of chocolate you used. I'm sure I can guess an amount, but I hate to waste any chocolate -- Thanks. Any suggestions for alternatives to coconut oil, coconut butter & almond milk for families who need to avoid all nut products due to severe allergies? You can sub sunflower butter and another kind of milk. You might be able to just omit the coconut oil? I haven't tried though. Lol. Mine too! I only write that because there is always someone who will ask. Just made these and they are fabulous! I added a small handful of almonds also, and it was like a homemade almond joy! Hi, these look amazing. But question, I don't have a food preocessor, can I use my Vitamix? Thank you! You might be able to? I am not 100% sure though. If you try, soak the dates in water for 15 minutes to soften them. Do you have a suggestion for almond milk that doesn't contain carageenan? I make my own, but I hear that Silk almond milk does not contain carrageenan. Whole foods almond milk has no carageenan. Could I just use 1 cup of unsweetened coconut flakes if I dont have coconut butter? I know I can make my own but not sure my food processor can handle it? Do you use a tablespoon of melted coconut oil? Can you substitute the dates with Deglet Noor type?